Part performance artist, part polemicist, Mr. Breitbart, 42, has used his network of Web sites and their legions of followers to bring conservative media red meat. Some of his reader-generated scoops have reverberated all the way to the halls of the United States Capitol, like the Weiner photos and undercover video he released of Acorn workers offering advice on how to evade taxes and conceal child prostitution. After the videos went viral Congress ended grants to Acorn, and federal agencies severed ties with the group. Conservative media does not lack for big personalities (see: Limbaugh, Rush; Beck, Glenn; or Coulter, Ann). But where Mr. Breitbart stands out is through his accessibility. He gives out his cellphone number in speeches and passes along his personal e-mail address to almost anyone who asks. If you write him, chances are you will hear back. Of course, the Times applies a completely different measuring stick to Breitbart but as the old adage goes, "there's no such thing as bad publicity." 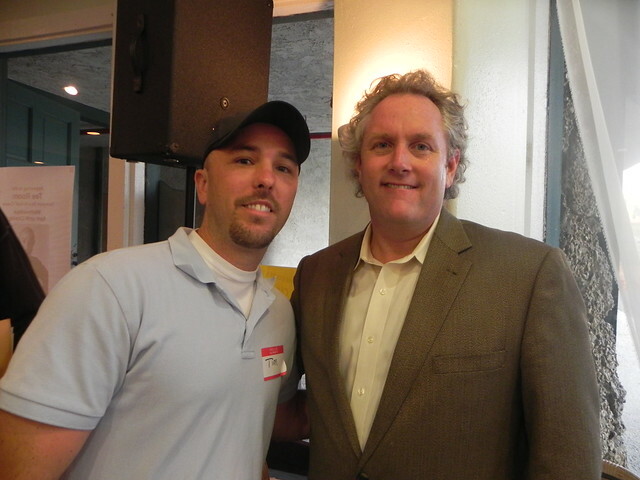 The Times writer is totally right about one thing that makes Andrew Breitbart unique: the ease in accessing him. When he was in the OC, Donald Douglas and I had no problem approaching him, I'm sure it wasn't just a Southern California thing. He probably would have been all-ears if I had a hot tip or something. Like I said that post about the Orange County Breitbart meetup, he's a super-intense guy and it shows in real person. Breitbart is still building his new-media empire and full features in The New York Times don't hurt that process.